Even though we get new details about Samsung's upcoming Galaxy Note 5 phablet on a daily basis, things are still confusing when it comes to specs. 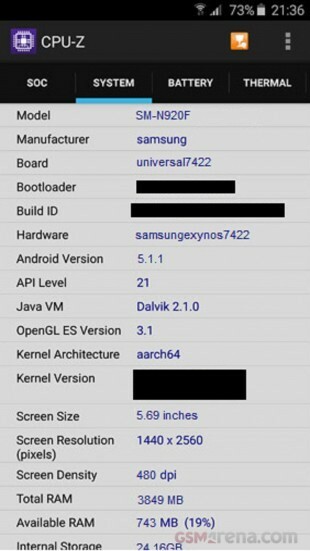 Previous rumors claimed Samsung Galaxy Note 5 will be equipped with a homegrown Exynos 742 chipset inside, the same processor that powers the Galaxy S6 and Galaxy S6 edge smartphones. The latest live pictures showing a prototype unit of the Galaxy Note 5 also confirm that the phone's S Pen won't be ejectable, so users will have to pull it out manually. Today, a new information sheds some light on the chipset that will be embedded into Samsung's Galaxy Note 5 phablet. The folks over at GSMArena have just got their hands on a screenshot taken from a Galaxy Note 5 benchmark. The application used, CPU-Z displays the hardware configuration of the Samsung Galaxy Note 5, model number SM-N920F. According to this benchmark, the Galaxy Note 5 will be equipped with an Exynos 7422 chipset, which is an improved version of the Exynos 7420 processor inside the Galaxy S6 and Galaxy S6 edge. Aside from that, it also confirms the fact that the phablet will pack 4GB of RAM and 32GB of internal memory. However, we expect Samsung to launch multiple Galaxy Note 5 variants with different storage amounts. Unfortunately, it's still unclear whether or not Samsung will add a microSD card slot inside the Galaxy Note 5. The good news is we won't have to wait too long to find out more about the phablet, since Samsung is expected to officially unveil the Galaxy Note 5 as early as August 12. If you're waiting for Samsung's flagship to be launched on the market, then you should know that the Galaxy Note 5 will only be available in select markets beginning August 21.